I don’t know about you, but I stopped trusting myself for quite a while. Nothing I tried seemed to reduce the severity or frequency of my migraines and I fell into a deep depression (for too many years). Luckily I learned different forms of energetic healing and meditation which lifted me up and calmed me down. Looking back I think I gave my power away. For some reason I thought my doctor knew best. They do know a million things I do not, and I still consider my doctor to be the expert. But in hindsight, it would have been better to just trust myself about my body. I spent a lot of time being afraid of dying. I used to think "no one can live through this much pain." But I am here to tell you we can! So make sure if you think that, that you say 'rubbish' or that is just not true. Our minds are like naughty little children, sometimes we just have to tell them to shut up. 1. Find some alone time away from all the chaos of life. 2. Take this time to just be silent and with yourself. A nice hot bath with Epsom salts and lavender essential oil sounds good. 3. Take 3 deep breaths and exhale nice and slowly. 5. If you meditate this will sound familiar. 6. Now ask yourself, “Am I ready to trust myself? Wholly and completely?” See what sensations come in your body. If you feel a contraction you have your answer. No! If you feel an expansion, you have your yes! Few of us slow down enough to truly listen to our inner voice. As you give yourself more time to listen to yourself, you will learn to trust yourself more and more each day. What advice would you give to a fellow migraineur early on their path around trusting themselves? Please click here to share your answer(s) in the Facebook comments box at the bottom of the home page. Reminder: If you get a sharp head pain that feels quite different to your 'normal' migraine, and it feels scary, please see your doctor asap or if it’s really intense get to your closest emergency department. Any severe head pain is not to be taken lightly. This is one of my favorite posts - How to Treat a Migraine with ice and heat. It is a must read. Building resilience all starts with having a plan. A solid pain management plan. These are my four pillars of strength. Build Your Own Migraine Tool Kit - Here is my post with eleven steps on exactly how to do it yourself! It has all the forms you need to print out and step by step instructions to navigate your way through building an effective chronic pain management strategy. I highly recommend reading Cynthia Perkin's Mindfulness Over Migraines e-book that explains the science behind mindfulness and why it helps migraines. And she explains the method step by step that she uses to eliminate her migraines in 15 minutes. Yes, you read that correctly ... eliminate in 15 minutes. It will be the best $6.99 you ever spend! Timing is everything when aborting a migraine attack. Do you know your tipping point? You will after you read her book. It changed everything for me. Wild Divine Biofeedback is an essential part of keeping my migraines at bay. Learning to control breath and body temperature could assist in reducing migraines or eliminating them all together, especially if they are stress related. Meditation is proven to help reduce migraine attacks. This system will teach you all of that. I love mine. Dr. Amy Myers Elimination Diet e-Course is much easier than doing it yourself - like I did. It is vital to find our migraine food triggers, and then avoid them where ever possible. Dr. Myers is an autoimmune expert. Just what we need! This e-course will guide you every step of the way. Food is so important to me, especially because it is the one thing I can control. I can choose what I put in my mouth. And after spending four years studying Chinese medicine and a few more studying nutrition, I know how crucial it is to healing. I can be proactive and help my body with nutritious foods and staying hydrated. I have a whole migraine food section that I hope you enjoy. Come check out the migraine safe recipes. As you know pain is very distracting. It is very hard to think straight with a migraine even if the pain phase is covered by your abortive, you may still experience confusion (or other migraine symptoms). What do you struggle with most? 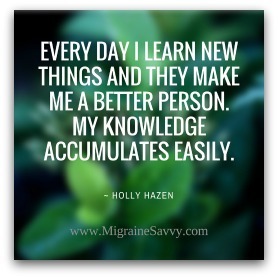 Have a place to vent your anger and share your pain here at Migraine Savvy. Post your story with those of us who understand completely. The good, the bad and the ugly! I hope you ENJOYED this issue of Surviving Chronic Migraine! If you’ve missed an issue click here to read the back issues. It’s time to spread the word about Migraines and educate our loved ones! They can click on this link to join the mailing list as well. I hope you come back and visit us again and again to see what's new.